The Ozark Folk Center is located on 640 wooded acres, just north of the city of Mountain View, a small town of less than 3,000 residents, in Stone County, Arkansas. The Park is approximately 100 miles north of Little Rock, Arkansas; 160 miles west of Memphis, Tennessee; and 300 miles south of St. Louis, Missouri. The Ozark Folk Center of Mountain View, Arkansas is America’s only facility that works to share the heritage and way of life of the Ozark Mountain people. They offer workshops in pioneer crafts, herb gardening, and traditional American folk music, as well as special folk arts & crafts programs for children and seniors. The Ozark Folk Center is dedicated to providing living history and exists to preserve, document, display, and interpret the cultural and social history of the Ozark region, an area that takes up part of five states: Arkansas, Illinois, Kansas, Missouri, and Oklahoma. Reservations: ANPS has reserved a block of 50 rooms within the campus of the Ozark Folk Center. All rooms have 2 queen beds; ask for a deluxe room if you want an outside deck. Please call (800) 264-3655 for reservations. Rooms will not be held past September 11! Be sure to mention “Arkansas Native Plants” when making reservations. The Skillet Restaurant (open 7am – 8pm) is located on the campus and offers country recipes made with the organic herbs grown in the surrounding gardens. Mountain View offers many other dining choices a short drive from the Folk Center. Several overflow hotel options are available. Here is a sampling of available motels to choose from: Anglers White River Resort – (870) 585-2226, Americas Best Value Inn – (870) 269-3775, Best Western Fiddlers Inn – (870) 269-2828, Days Inn – (870) 269-3287. 5:00 – 6:30 – Registration and potluck. ANPSers are encouraged to bring snacks and munchies to share. Drinks will be provided. All other meals are on-your-own. There are grocery stores and fast food restaurants as well as sit down restaurants in the vicinity (see Folk Center’s Skillet Restaurant info above). 6:30-7:00 pm – Field trip announcements. 7:00-10:00 pm – Fall Plant Auction. Bring your native plants, bulbs, seeds, as well as books, jellies, wines, leatherwood bracelets, and all other things botanical for sale at our annual auction. Proceeds build our Aileen McWilliam and Delzie Demaree grants and scholarships. For more information about the grants and scholarships click HERE. Registration and pot luck snacks begin at 5:30. Info and sign-up for Sunday morning hike available tonight. 6:30 pm – The featured speaker for Saturday night is Tina Marie Wilcox who is the head gardener and herbalist at the Ozark Folk Center’s Heritage Herb Garden in Mountain View and has been since 1984. She designs and tends the extensive gardens, plans and coordinates annual herbal events and workshops, and facilitates the production of sale plants, seeds, and herbal products for the park. She has presented countless educational and entertaining herb and gardening programs throughout the United States. Tina serves on the International Herb Association’s Board of Directors. She is also a member of the Herb Society of America, the Arkansas Native Plant Society, and the American Botanical Council. Brent Baker and Jennifer Ogle will provide an update on the Arkansas Vascular Flora Project after the featured speaker Saturday evening. Copies of the new Atlas may be available for purchase! General meeting to follow the presentations. Field Trip information will be provided Friday and Saturday evenings. QUESTIONS? MORE INFORMATION? Contact Betty Owen at pjmbowen@gmail.com or Eric Sundell at esundell42@gmail.com. 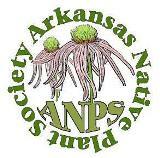 This entry was posted in Chapter Meetings and tagged Arkansas Native Plant Society, Fall meeting, Ozark Folk Center. Bookmark the permalink.